So I've been reading all of the entries for my giveaway. You guys are awesome. The entries make me laugh and they make me cry. It was a wonderful thing to wake up to on Thursday. And again, if you haven't entered my giveaway, you can find the link to the right. Oh, and those who asked me questions, I will get back to you as soon as possible. Promise. Now a pick for Steph. Rose Bowl is a dusty rose creme. Two coats with topcoat. 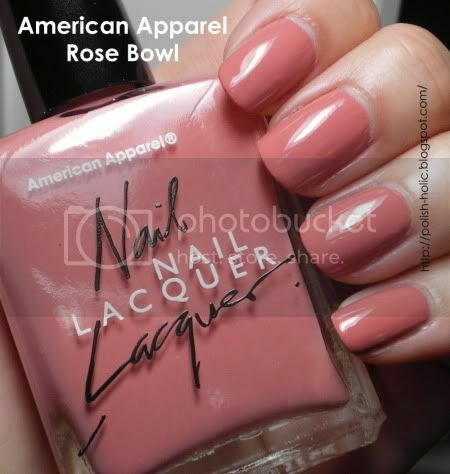 You know, American Apparel polishes remind me very much of Rescue Beauty Lounge polishes. Fantastic formula. But more specifically it reminds me of Resucue Beauty Lounge Om. I would do a comparison for you guys but I have since swapped it away. Pic of the Moment: Aw man, Hello Kitty's so cute. That's all I've got. She's just cute. Joseph Senor created a bunch of iconic Kitties. 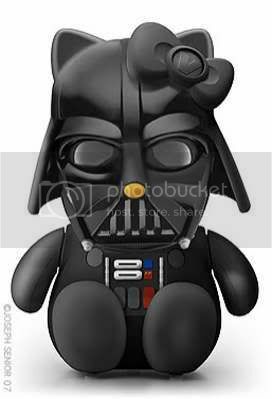 Here's Darth Kitty. To see the rest, go here. this color is sooooo cute! I need this! Hey the color's so pretty!! Lois: Bonus to the colour, application is awesome!